MP3 Mixer - DJ Mixer Mac, audio music sound mixer. The easiest way for anyone to create seamless music & video mixes. The world's most simple DJ mixing software for Mac and Windows that’s simple enough for the novice, but feature rich enough for any experienced DJs. 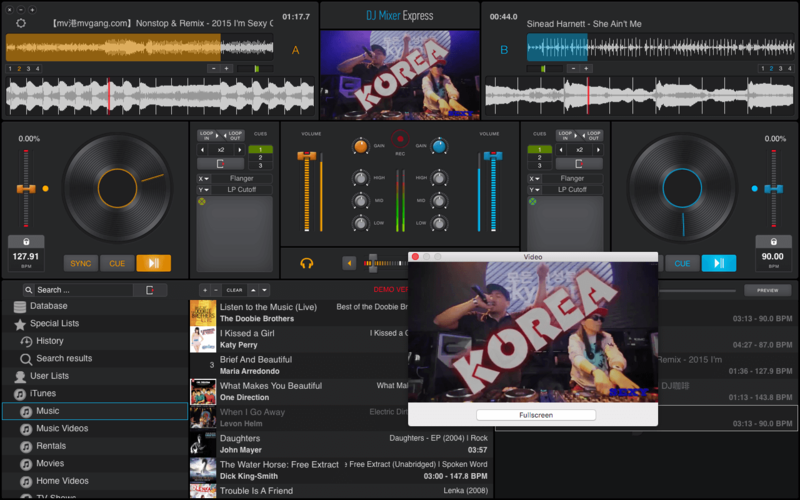 Simply start our DJ mixing software to mix your music, videos & karaoke! Whether your songs come from hard drive or from your iTunes, simply drag & drop music or video onto the decks or into the playlist and you're ready to go! Runs on both Mac OS X and Windows, fully compatible with Windows 10 & macOS Mojave 10.14. Whether you're a DJ or just creating cool mix CDs, this tool is for you! Mix MP3s, record your own, set volume fades and pans via a simple graphical interface! Its your soup. Mix it well! Exports to MP3, RealAudio(R) and wave files. Now saves as MP3! * Cut and paste sounds & MP3s quickly and easy! * Mix, record or overdub as many simultaneous Wave and MP3 files as you want. * Fade the volume, pan and playback rate of each sound. * Import playlists (.M3U & .PLS) to create instant mixes of your favorite mp3s! * Export mix as a RealAudio G2 or MP3 file with a click for streaming on the Internet. * Export mix as a single wav file or multiple wav files for burning a DJ style mix CD. Acoustica MP3 Audio Mixer is retailed online by RegNow!, click here to find more ordering information. If you require the Realaudio G2, download this optional RealAudio plugin, which enables MP3 Audio Mixer to save to Realaudio G2 files. "You guys provide an amazing program to the world! When I downloaded the program I was expecting it to be like some of the other programs that claim to be the best. I was shocked to find your product was really better!"